Apple Cinnamon Rolls - Chocolate Chocolate and More! 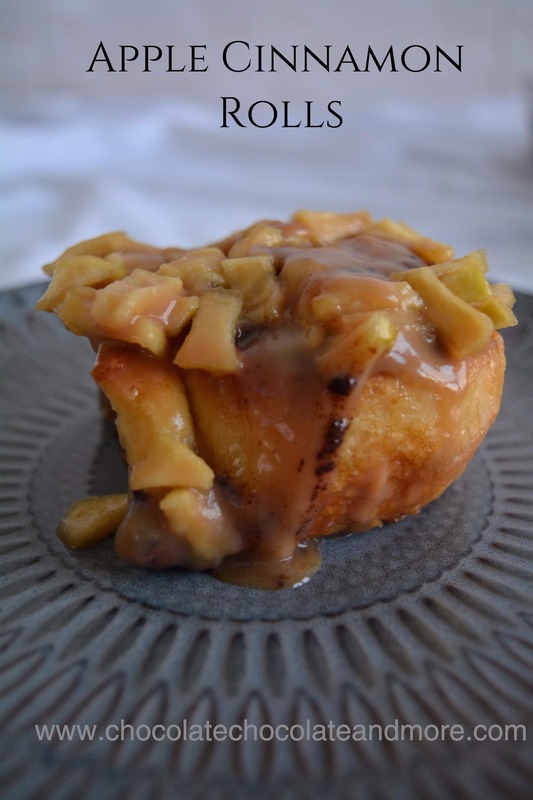 Homemade caramel sauce and chopped apples inside and out makes these Apple Cinnamon Rolls burst with fall flavors. Make a batch ahead and freeze them so you can have them any time. Joan left this partially finished recipe behind. It had everything but the topping so I had to imagine what she envisioned. I made these three different ways. First I followed Joan’s recipe for cinnamon rolls but added sliced apples in the middle. These tasted great but still lacked a topping. So, if you’re in a rush, you can actually skip the topping in this recipe. My second idea was to put apples and caramel ingredients on the bottom of the pan before I put the cinnamon rolls on top. I hoped to invert the whole pan on a tray and have instant caramel apple cinnamon rolls. Problem was the caramel ingredients really didn’t caramelize (maybe I overdid the apples?). They tasted great but didn’t look all that appetizing. For round three, I though I’d make the cinnamon rolls with apples inside and then top them with caramel and more apples after I baked them. This worked well. Even though my friends were happy with the previous two “mistakes” I think this is the one. Guess the third time really is the charm. 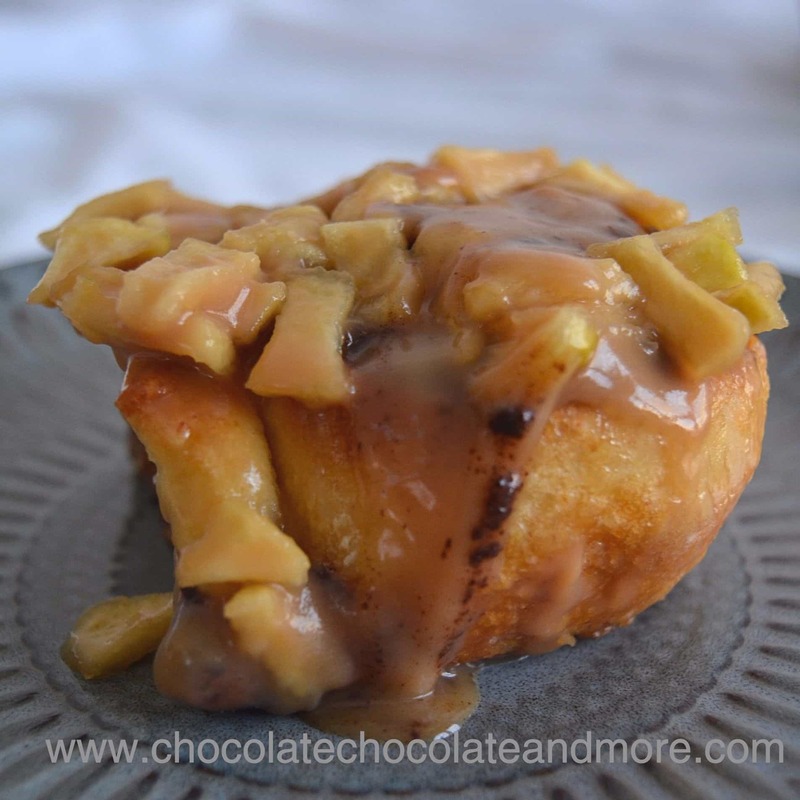 These apple cinnamon rolls are wonderful even without the caramel and apples on top but I really couldn’t resist. If you’re really in a rush, you can substitute caramel ice-cream topping. Heat it up a little before you pour it on the apples so the apples soften up. These apple cinnamon rolls freeze really well. You can refrigerate or freeze them right before baking. Just make sure they’re room temperature before you put them in the oven. You can also freeze the finished rolls. If you want to have some handy for a quick breakfast, wrap finished rolls individually and freeze. Then pull some out the night before to thaw or (if you’re daring) microwave them in the morning. In a small saucepan, heat milk, water and butter over low heat until butter is melted, remove from heat and allow milk to cool to lukewarm temperature. Place 3 ¼ cups flour, yeast, sugar and salt in a large mixing bowl, stir to combine. Add egg and mix together. Add milk mixture slowly. and mix together to make a soft dough. Knead in the remaining flour to make a soft smooth dough (you may need an additional ¼ cup flour to get the smooth dough). While the dough is rising, butter the bottom and sides of a 9 x 15 inch pan (3 quart pyrex) and peel and chop the apples. Mix butter, cinnamon and brown sugar in a small bowl until very smooth. Turn dough out onto a floured surface. Roll or pat the dough out to about 9" x 15". Spread the cinnamon sugar mixture on top. Then spread 2 cups of chopped apples on top. Starting on the long side, roll dough, jelly roll style. Cut into 12 slices and place each slice cut side down on the prepared pan (you will have 4 rows of three rolls). Cover with plastic wrap and let rise until doubled and spaces between rolls are no longer visible. (at this point you can also place in the refrigerator for baking later). Once rolls are risen, remove plastic wrap and bake in a preheated 350 °F oven for 20 - 25 minutes, until golden brown. 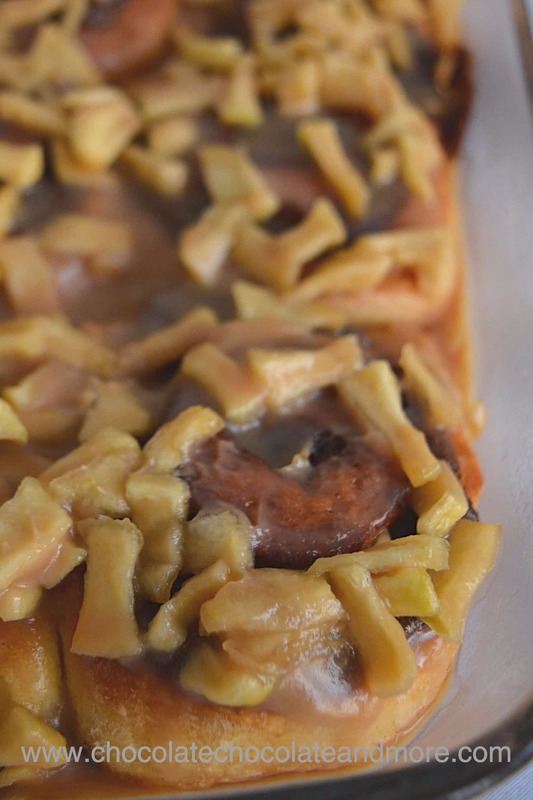 Remove from oven and top with chopped apples. Place sugar and corn syrup in a heavy saucepan. For your safety, the pan should be large enough that the boiling sugar is just about an inch deep and the sides are 5-6 inches higher than the top of the sugar. Heat over a medium heat until the mixture boils. Continue heating watching very carefully until sugar turns a golden brown. At this point the sugar is almost done so you can turn the heat down. Heat just a minute or two longer until the sugar is a medium brown. Remove from heat and add the cream all at once. Stir vigorously while you add the cream but be careful not to splash the hot sugar on yourself. Stir in the butter and bourbon (if desired). 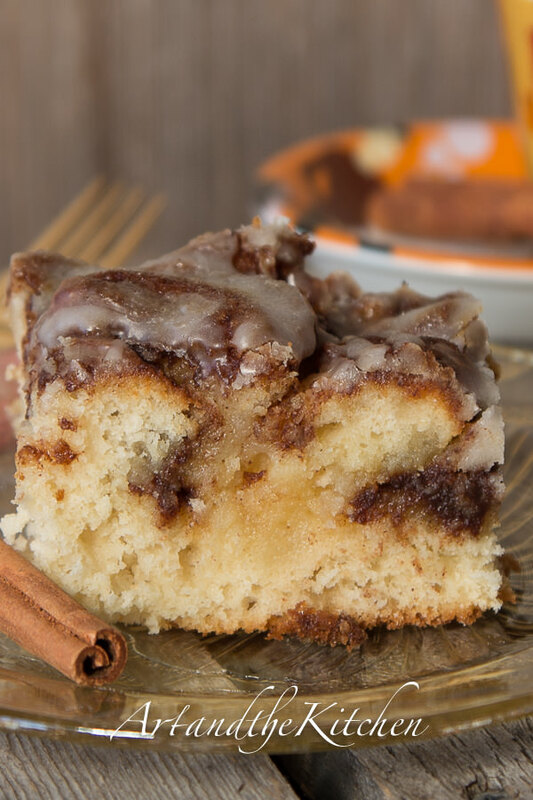 Pour over the cinnamon rolls. Wait until caramel cools so it's warm to the touch but not scalding before you serve (about 5-10 minutes). What did you do with the apples that you put on the top of the rolls? Did you leave them raw? I can’t imagine biting into a nice roll like this and have a bite of raw apple! The directions don’t say anything about cooking the apples before putting on top of the baked rolls. Please clarify. Hi Glennis. Great question. The caramel sauce was VERY hot when I poured it on the rolls. It was hot enough to soften the apples. If you want them even more soft. Add them to the caramel sauce and heat gently before pouring on the rolls.